Bazaar supports many different ways of working together. This means that you can start with one workflow and adapt it over time as circumstances change. There is no “one true way” that always makes sense and there never will be. This section provides a brief overview of some popular workflows supported by Bazaar. Keep in mind that these workflow are just some examples of how Bazaar can be used. You may want to use a workflow not listed here, perhaps building on the ideas below. Whether developing software, editing documents or changing configuration files, having an easy-to-use VCS tool can help. A single user can use this workflow effectively for managing projects where they are the only contributor. 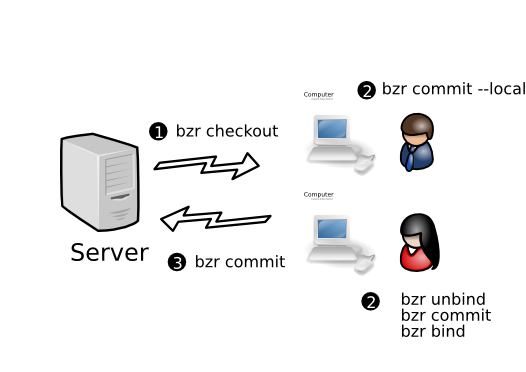 The key features of Bazaar appropriate for this workflow are low administration (no server setup) and ease of use. Sometimes two people need to work together sharing changes as they go. This commonly starts off as a Solo workflow (see above) or a team-oriented workflow (see below). At some point, the second person takes a branch (copy including history) of what the first person has done. They can then work in parallel exchanging changes by merging when appropriate. each line of each text file can be attributed to a particular change including who changed it, when and why. intelligent merging means merging multiple times isn’t painful. Also known as lock-step, this is essentially the same as the workflow encouraged/enforced by CVS and Subversion. All developers work on the same branch (or branches). 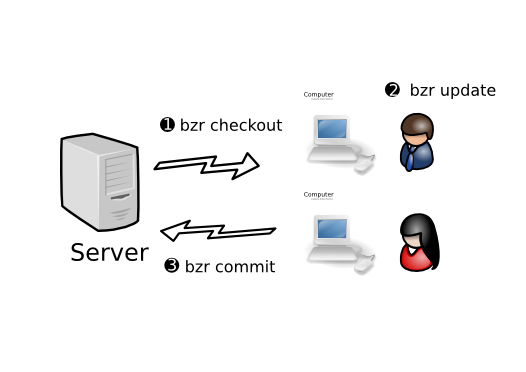 They run bzr update to get their checkout up-to-date, then bzr commit to publish their changes to the central location. This is essentially the same as the Centralized model, except that when developers are making a series of changes, they do commit --local or unbind their checkout. When it is complete, they commit their work to the shared mainline. Subversion and CVS do not support this model. Other distributed VCS tools can support it but do so less directly than Bazaar does. 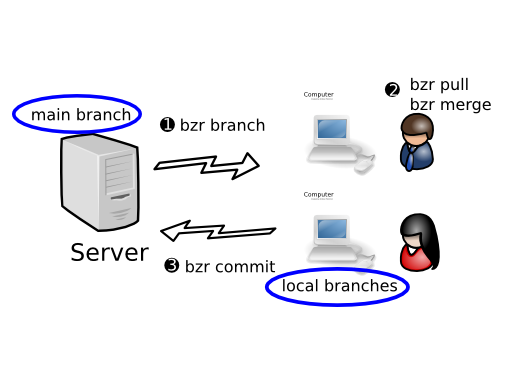 In this workflow, each developer has their own branch or branches, plus commit rights to the main branch. They do their work in their personal branch, then merge it into the mainline when it is ready. Developers can merge one another’s personal branches when working on something together. Subversion and CVS do not support this model. Other distributed VCS tools support it. Many features of Bazaar are good for this workflow including ease of use, shared repositories, integrated merging and rich metadata (including directory rename tracking). 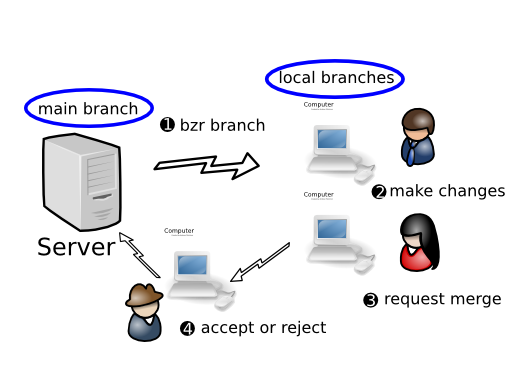 In this workflow, each developer has their own branch or branches, plus read-only access to the main branch. One developer (the gatekeeper) has commit rights to the main branch. When a developer wants their work merged, they ask the gatekeeper to merge it. The gatekeeper does code review, and merges the work into the main branch if it meets the necessary standards. Tighter control over when changes get incorporated into the mainline. A companion tool of Bazaar’s called Bundle Buggy can be very useful for tracking what changes are up for review, their status and reviewer comments. 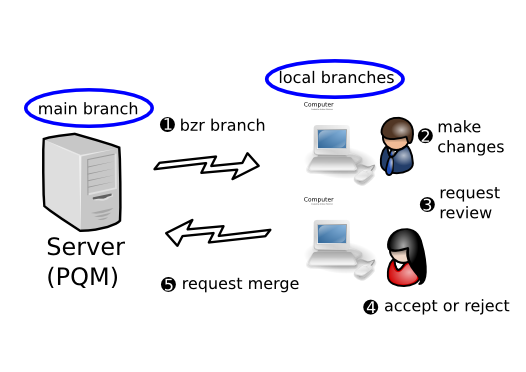 In this workflow, each developer has their own branch or branches, plus read-only access to the mainline. A software gatekeeper has commit rights to the main branch. When a developer wants their work merged, they request another person to review it. Once it has passed review, either the original author or the reviewer asks the gatekeeper software to merge it, depending on team policies. The gatekeeper software does a merge, a compile, and runs the test suite. If and only if the code passes, it is merged into the mainline. Scales better as teams grow. A companion tool of Bazaar’s called Patch Queue Manager (PQM) can provide the automated gatekeeper capability. For an in-depth look at how to implement each of the workflows above, see chapters 3 to 6 in this manual. First though, chapter 2 explains some important pre-requisites including installation, general usage instructions and configuration tips.